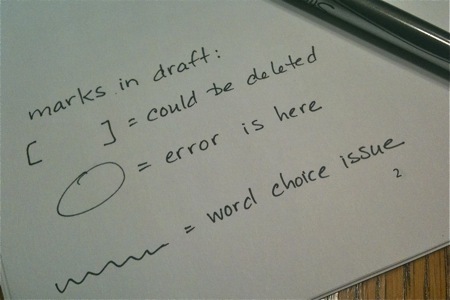 On drafts, I prefer to handwrite my margin comments and type my summary comments. Writing by hand is (a) faster for me and (b) friendlier for the author, leaving traces of a reader. I have neat handwriting, and I don’t savage a page with my own scribbles, so this works well. Many of my comments are particular to the content: “These are your objectives, but what problem with this protein — a research one — is at the heart of what you plan to do?” Then there are the moves I make over and over in everyone’s draft, pointing out some aspects of style that could be improved, and I want to leave the responsibility for alteration or correction to the author. They are, quite simply, the ones shown here, and I define them on some spare scrap at the beginning of the hard copy of a draft. Sure, I have a good vocabulary, feel for style (not just my own), and knowledge of grammar, and I could go the extra step and make all these changes. My hope, though, is that these marks will bring choices or errors to the attention of the author and that s/he will puzzle them out, alone or in a conversation with me.